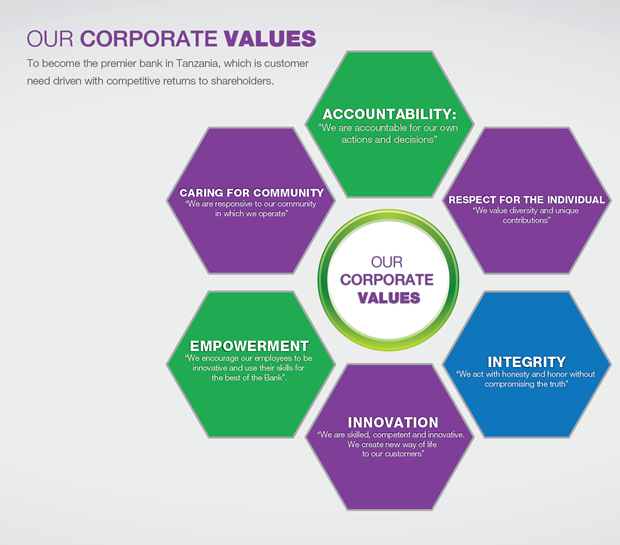 All employees of the Bank are expected to demonstrate the following values in their daily activities and in decision making. Accountability: We are accountable for our own actions and decisions. Integrity: We act with honesty and honor without compromising the truth. Respect for the individuals: We value diversity and unique contributions. Caring for Community: We are responsive to our community in which we operate. Empowerment: We encourage our employees to be innovative and use their skills for the best of the bank. Innovation: We are skilled, competent and innovative. We create new ways of life to our customer.